I just bought this, summoned it - and after a relog, it was gone from my companions tab! The ticket is currently pending, but I'd hold off on buying this for now, in case it's a general issue and not just related to my character. I will update when the ticket is resolved. Update: this is now a known issue, the zeppelin is removed from your companions tab whenever you zone... I got it back, and then immediately lost it again :) You're better off spending your tickets on another pet for now. From what I've seen so far, the Lil' XT can and will end up breaking the zeppelin; saw it happen a few times while in a raid group. The Zeppelin also seems to crash or break on it's own periodically; the gas bag will burst and the remainder will fall to the ground and despawn shortly after. Not sure if it's on a timer or if there's some other cause, or if it only breaks when around a Lil' XT. Will have to keep my eye open when it does break again. I think out of all of the darkmoon pets that this one will be the most interesting in the pet battles. Just got this pet today, and wanted to note that it flies along with you when mounted. The pet will fly alongside you when you're mounted and the rotor makes a constant buzzing sound when you're still. 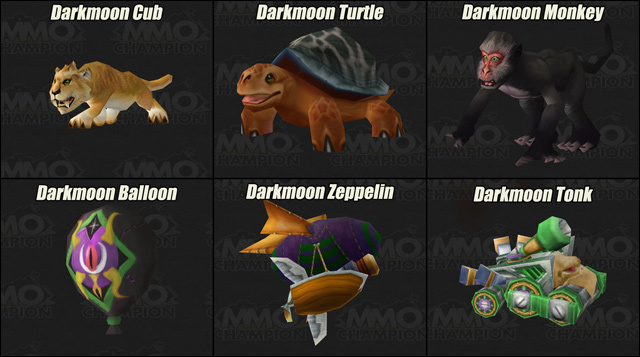 Of the 6 new Darkmoon Faire pets that one can buy with Darkmoon Prize Tickets, the Darkmoon Zeppelin is the only one that will fly alongside your airborne mount. Even the Darkmoon Balloon will not do the same. Just to be clear: These Zeppelins are actual companions and do NOT stay in your inventory like the toy Zeppelins. You cannot play with this one. Not to be confused with a Led Zeppelin. Unless they are performing inside this Zeppelin. Of which I would pay real money to see. When you click on it, the zeppelin sounds like you're tapping a keg, so I named mine Goodbeer. Now he goes nicely with Beer Nuts who I taught to throw peanuts instead of acorns. Yep, this is a great pet, it has some nice damage abilities. I haven't levelled it up yet but I had a chuckle at the Explosive ability. Today I can confirm that doing the Darkmoon daily mini-games can reward you Zepelín de la Luna Negra as well as Tonque de la Luna Negra. This must have been my lucky day because I received one of each in two different Premio de juego de la Luna Negras. This thing has died so many times while levelling it - not because it's a bad pet (because let's face it, it isn't) but because I love watching it get hit - the little boat part swings underneath the balloon. Super cute! Decoy, or other pets with similar two round blocks, is a great way to train your level 1 pets up against 24-25 pets. Start with zeppelin, decoy, switch in level 1 pet, then go back to zeppelin. Kill stuff until decoy is off cooldown and then do the same trick for the other level 1 pet. 2 battles should net you, without bonuses, 7 levels. Just got one from a Darkmoon Game Prize. When I was originally farming the Darkmoon Faire during MoP, I got 2 pets to drop before I had all mounts and pets, which was nice because it saved me 180 Vale de la Luna Negra. More recently, I have done quite a few additional things at the faire, including earning all of the achievements, buying various heirlooms, and farming up almost all of the 1000 tickets for the Dirigible de la Luna Negra without seeing a single pet drop, so I thought that maybe the pets could no longer drop from the daily quests. I could not find information on wowhead or elsewhere to confirm one way or the other, though. However, today, I received Cachorro de la Luna Negra from a Premio de juego de la Luna Negra, so I thought I would post here in case anyone else has had the same question.